Last week I was really interested about the elections for the U.S. House of Representatives. I wondered who would win the 7th District? Would the Republicans regain the majority in the House? After the elections on November 2nd, the votes have been counted and the answers have been revealed! In Virginia's 7th District, the winner was Eric Cantor who won with a 59.4% majority. He was also promoted to the Majority House Leader position in the House of Representatives after formally being the Minority House Whip. The Republican party did regain control of the House despite the Democrat's efforts to retain the majority. We will have to wait and see how this change in power turns out! For our country's sake, I hope it goes alright. In class this week, we learned about the military, the elderly, and a group called the "Maine Troop Greeters". We learned background information and watched the movie The Way We Get By to learn more about the Greeters and their stories. All of these topics were centered around support for our troops and Veteran's Day that also occurred this week. 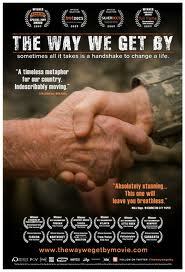 I really enjoyed the documentary The Way We Get By , and I am so glad that we were able to watch it. I thought that it had a really great message about love, commitment, and sacrifice. I feel that our troops are not appreciated as much as they should be. Because of this, I totally support the Greeters and think that they are doing a very honorable service for their community. 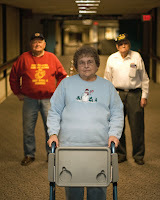 The dedication of Bill, Joan, and Jerry is absolutely inspiring and makes me want to go out and greet troops with them! Hearing their stories, both the sad parts as well as the happy, really made me think about our elderly population. Seeing how lonely they can be and how isolated they are makes me feel really sad. I feel so bad for them, but I know that they enjoy what they do. Greeting the troops keeps them going and helps to bring meaning back to their lives. It is amazing what one handshake can do. One question that was not brought up in class was whether or not we would be willing to greet troops just the Troop Greeters do. I think that I would definitely be willing to greet the returning troops and tell them how much I appreciate what they do. On the other hand, I do not think that I would be able to handle saying goodbye to the leaving troops. I don't think that I could emotionally handle it. All of the sadness in the air and knowing that some of them will not be returning would be too much for me. I think others should definitley be there to wish them off, but personally I don't think that I should be there. After all of this talk about the Troop Greeters located in Bangor Airport, I would like to know a little bit more about their impact. Currently how many troops have they greeted? Also what about other similar groups? What kind of impact are they making?